All in preflop, Jacks v A5 and the flop is A-J-K. You're feeling pretty good to see you flopped middle set, right? How about on the turn when another Ace falls and now you have Jacks Full. Well, then there's the Barry Greenstein ... Ace on the River. 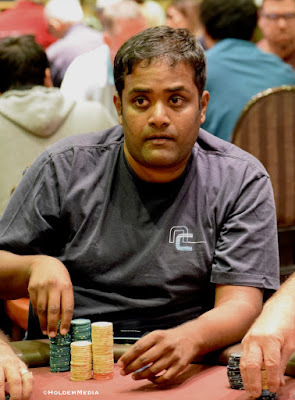 Sure, you improve to Aces Full but Navin Mohan (above) improved to quads and scored a knockout here in Level 7 on Day 2 of the monolith.